Artist's rendering of the Multi-Purpose Crew Vehicle on a deep space mission. This story was updated at 5:45 p.m. EDT. NASA on Tuesday announced a plan to develop a new deep space vehicle, one based on an earlier capsule concept, in order to send astronauts on expeditions to an asteroid, and then on to Mars. President Barack Obama shut down the Constellation program last year, tasking NASA instead with sending people to an asteroid by 2025, and then to aim for crewed Mars missions by the 2030s. 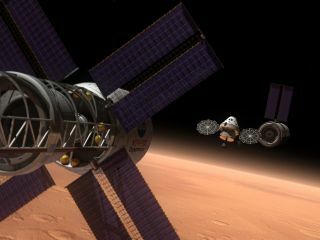 Modifying the Orion capsule design — rather than drawing up plans for an entirely new spaceship — should help make that feasible, agency officials said. "We made this choice based on the progress that's been made to date," Doug Cooke, associate administrator for NASA's Exploration Systems Mission Directorate in Washington, D.C., told reporters today. "It made the most sense to stick with it [the Orion design]." Lockheed Martin Corp., NASA's prime contractor for Orion, will continue work to develop the MPCV spacecraft. So far, NASA has already invested a little more than $5 billion in the spaceship, which is pretty far along, Cooke said. For example, Lockheed has already built a full-size mock-up vehicle, called a Ground Test Article, and will soon subject it to a series of rigorous trials at a facility in Colorado. The spacecraft will be NASA's primary vehicle for delivering astronauts to destinations beyond low-Earth orbit, such as asteroids or Mars. Such journeys would take months, and the four astronauts won't be cooped up in the cramped MPCV the entire time. Rather, the capsule will meet up with some type of habitation module in space, making the trip much more comfortable. "You wouldn't expect a crew to live in this for long periods of time," Cooke said. The MPCV is designed to be 10 times safer during launch, re-entry and landing than its predecessor, the space shuttle, NASA officials said. Much of this improved safety comes from a launch-abort system, which can steer the crew away from its rocket in case anything goes wrong during liftoff, Cooke said. The space shuttle has no such capability. The MPCV will be capable of performing a variety of in-space activities, such as rendezvousing and docking with other craft. And astronauts aboard the MPCV will be able to perform spacewalks, officials said. Though its chief calling is roaming far afield, the spaceship may also be called upon to deliver cargo and crew to the International Space Station from time to time. "It's basically overkill for that type of mission, but it could do that," Cooke said. Cutaway view of the Multi Purpose Crew Vehicle. The Orion space capsule was originally designed to launch on NASA's Ares 1 rocket, with a larger heavy-lift rocket called Ares 5 planned to launch moon landers and other deep space flight hardware. But the cancellation of the Constellation program nixed the Ares vehicles, so things are different for the MPCV. It will lift off aboard the Space Launch System (SLS), a new heavy-lift rocket that NASA is also developing, agency officials said. Last year, Congress instructed the agency to have the spaceship and the SLS ready to go by 2016. That's not likely to happen, however, as NASA officials have yet to settle on a final design for the rocket. That decision should come soon, according to Cooke. "We will be working toward solutions and final decisions on the launch vehicle in the coming weeks, and are still shooting for the earliest possible dates in the early summer for completing that," he said. With all the uncertainty surrounding the SLS, Cooke declined to venture a guess about when the MPCV could start carrying crews for the first time. He said initial test flights should take place sometime this decade, and it's possible that they'll use rockets other than the SLS. "We haven't made any decision on a launch vehicle for test flights," Cooke said. In its original incarnation, the Orion capsule was supposed to make its first test flight in 2013 and begin operations by 2016. Since the MPCV is based on existing designs, it won't require a radical rethink. And that thread of continuity may be welcome at NASA, which is in a period of dramatic transition. In the short term, NASA astronauts will get rides to the space station aboard Russian Soyuz vehicles. But over the long haul, Obama's vision calls for commercial American spaceships to provide this taxi service. NASA is working with and funding several private companies, such as California-based SpaceX, to help them develop these new craft. That move is intended to free NASA up for more ambitious exploration efforts. "The NASA Authorization Act lays out a clear path forward for us by handing off transportation to the International Space Station to our private sector partners, so we can focus on deep space exploration," NASA Administrator Charlie Bolden said in a statement. "As we aggressively continue our work on a heavy lift launch vehicle, we are moving forward with an existing contract to keep development of our new crew vehicle on track."